Interested in Plant Health & Pest Management? Below you can find out all the details about Farm School NYC's Plant Health course, as well as our other Summer and Fall offerings! Thanks for your interest in Farm School NYC and if you have any questions we don't cover here, you can reach out to Farm School NYC's director, Onika Abraham anytime. This course is an introduction to organic pest and disease management. We will begin to identify common NYC pests and diseases and discuss prevention and management strategies, including cultural practices, mechanical and biological controls and low-toxic treatment. Crop Management: This course will explore the best crops for NYC’s climate, weed management, succession planning and planting, inter-planting, harvesting and post-harvest handling techniques, review of common crop plant families and their specific needs including vegetables, herbs, flowers and fruit, and summer pruning. Plant Health: This course is an introduction to organic pest and disease management. We will begin to identify common NYC pests and diseases and discuss prevention and management strategies, including cultural practices, mechanical and biological controls and low-toxic treatment. 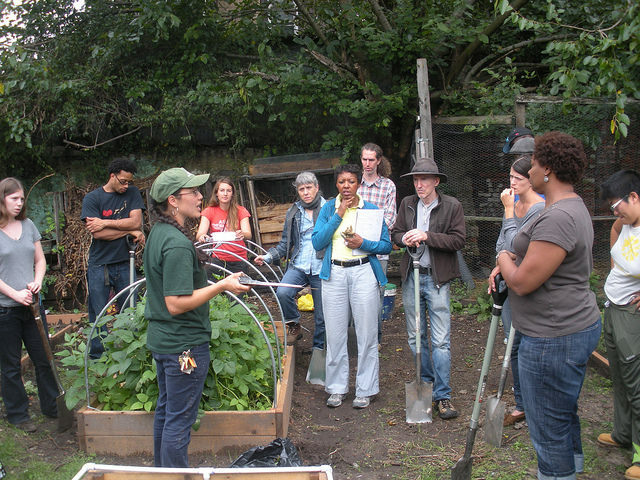 Small Farm Planning & Design: This course will review the value of and types of record keeping for your community garden, urban farm, or food-related business. Learn practical elements of community garden, school garden and urban farm design, business planning 101, beginner marketing concepts and program planning. Learn about the theory and practice of asset-based community mapping. There are several prerequisites for this course. Please contact us for more information.